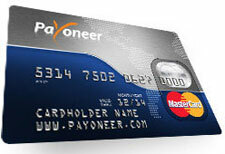 To learn more visit the FAQ on Payoneer`s website. Also Payoneer provides the US Payment Service upon request, which allows the bank transfers to the card from the major companies in the world, including money transfer from PayPal and MoneyBookers accounts. You can apply for new card or add an existing one in the Payouts section. Just change your method of payout and select Payoneer.